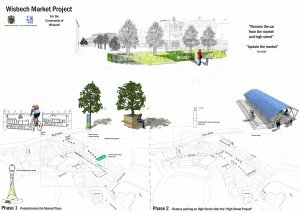 On 13 August members considered further the design and delivery of an enhancement scheme for Wisbech Market Place. The Clerk provided members with a report which summarised the outcome of the (on-line) public consultation exercise which had been undertaken (and had concluded at 5.00 pm on 10 August 2018) regarding the possibility of bringing forward (from 10.00 am) to 7.00 am the proposed commencement time of "pedestrianisation" of the Market Place area and the addition of Hill Street and High Street to the area from which vehicles would be prohibited between the hours of 7.00 am and 4.00 pm. three-quarters of those who had responded had indicated support for allowing access within the "pedestrianised" area for deliveries between 7.00 am and 10.00 am; 10% of respondents expressed the opinion that access to the Market Place area by delivery vehicles is required at all times. In addition to the report which he had circulated, the Clerk summarised to members three individual letters that had been received by the council in response to the consultation exercise. Councillor Tierney mentioned that a number of the individual comments which had been made by respondents to the consultation exercise are contradictory, which demonstrates that whatever action the council takes in terms of the delivery of an enhancement scheme, the various elements would be liked by some people and disliked by others. The Chairman expressed the opinion that the outcome of the public consultation exercise indicates clearly that the majority of people support "pedestrianisation" of the Market Place area between 7.00 am and 4.00 pm each day, with access to that area by delivery vehicles between 7.00 am and 10.00 am; there is, however, a level of public concern regarding the possible "closure" of Hill Street and High Street. Councillor Miss Hoy informed members that she had received contact from a number of members of the public, expressing concern regarding the prevention of access, as a consequence of closing Hill Street, to the four existing Disabled parking spaces which are adjacent to the Market Place. Councillor Lynn suggested that, given the concerns which had been expressed by some members of the public regarding the prevention of access to the four existing Disabled parking spaces which are adjacent to the Market Place, Hill Street should not be closed to all traffic, merely to large/heavy vehicles; he suggested also that, to improve vehicular access and traffic flow, parking restrictions (double-yellow lines) should be introduced along both sides of Hill Street and that the existing loading bays should be removed. Councillor Oliver, having listened to the comments made by members regarding this matter, proposed that the Clerk and he be authorised to have a further dialogue with representatives of the Local Highway Authority for the purpose of proposing that, instead of closing Hill Street between 7.00 am and 4.00 pm, parking restrictions (double-yellow lines) be introduced along both sides of Hill Street, the existing loading bays be removed and that a 5 tonnes weight limit be introduced. Councillor Tierney commented that, given the concerns which had been raised by some members of the public, he would not support the loss of the four existing Disabled parking spaces which are adjacent to the Market Place. He stated that he would be happy to support Councillor Oliver's proposal. In addition, Councillor Tierney suggested that a Taxi drop-off bay be provided at a suitable location within the Market Place area. Councillor Oliver commented that he would be happy to refer that suggestion to the Local Highway Authority. Given the outcome of the public consultation exercise, the council would pursue with the Local Highway Authority (LHA) bringing forward (from 10.00 am) to 7.00 am the proposed commencement time of "pedestrianisation" of the Market Place area but without the inclusion of Hill Street and High Street to the area from which vehicles would be prohibited between the hours of 7.00 am and 4.00 pm; Councillor Oliver and the Clerk be authorised to have a further dialogue with representatives of the LHA for the purpose of proposing that, instead of closing Hill Street between 7.00 am and 4.00 pm each day, parking restrictions (double-yellow lines) be introduced along both sides of Hill Street, the existing loading bays be removed and that a 5 tonnes weight limit be introduced. Wisbech Town Council wishes to support local businesses within the redevelopment of the market place and town centre. Quotes for any aspect of the plans, or the overall scheme, are welcome - please get in touch if further information is required. We will also add a Tidal Clock, as a nod to our town's historic nautical links and to the plans of designers years ago. This will be an attractive feature. At one end of the Market Place we hope to introduce a small Children's Play Area, nothing too grand, but fun for the youngsters and a chance for a break for busy parents with children in tow.